NOW AVAILABLE. 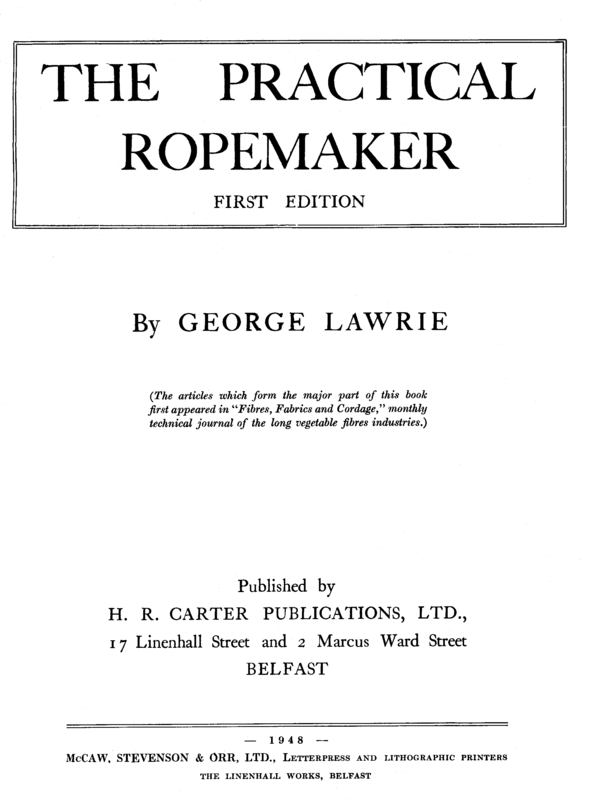 Reprint of George Lawrie's The Practical Ropemaker. It was published by H. R. Carter Publications in Belfast, (North) Ireland in 1948. This book documents the commercial vegetable (manila, sisal, etc) fiber rope manufacturing operations of the era, from fiber processing to spinning, manufacturing cordage, packaging, etc. Contains numerous figures, calculations, pictures, tables. The glossary of rope terms and products covers 22 pages. Read Chapter One in .pdf file. The book is 123 pages, in 8.5" by 11" format, down slightly from the original A4 page format. Softbound with Perfectbind. Read it to get a feel of the ropemaking industry of that era. The equipment shown is the predecessor to the automated machinery used today. The calculations, glossary, and some of the reference tables would still be applicable. This is a good historical book for the Engineer. It is referenced in Himmelfarb's book published in the mid-50's. Not a practical book for learning to make rope.